Today the start of a major beautification to the “main street” of Fort Langley was launched. The village core will soon be rid of the blight of overhead wires and utility paraphernalia. 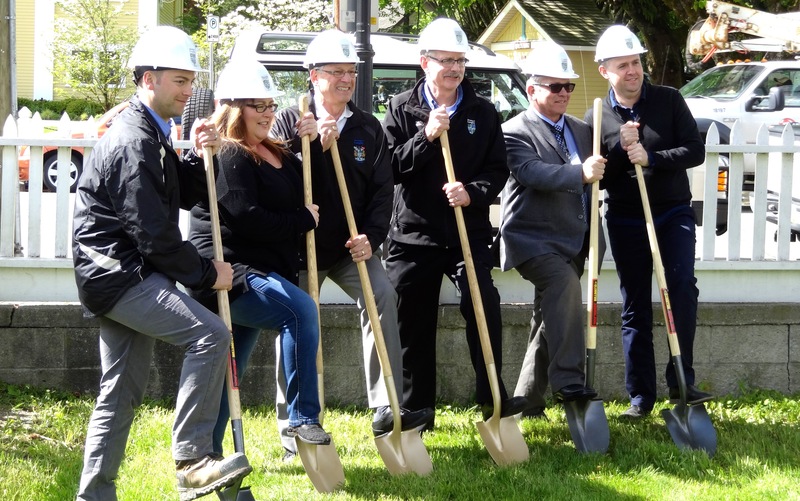 Mayor Jack Froese and Councillors Charlie Fox and Angie Quaale joined Eric Woodward, President of the Business Improvement Area, to put a ceremonial shovel in the ground to show Fort Langley has not been forgotten. The $3 million utility undergrounding project includes sidewalk lighting, street trees and banner hangars on Glover Rd and Mavis Ave.
Oh, what a web they have woven – utility wires soon to be gone! This entry was posted in Fort Langley Village News, Heritage Matters. Bookmark the permalink.